Great Lengths by Dr Ian Gordon and Simon Inglis, which is available to buy online, and Liquid Assets by Janet Smith, which is sadly out of print, are the result of an important partnership between English Heritage and Malavan Media. The two organisations worked together for a number of years to produce a series of books on Britain’s sporting heritage. Established in 2015, Historic Pools of Britain is that organisation, and launched in 2017, this is the website to which the passage refers. 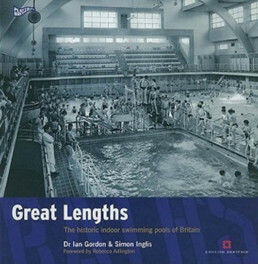 Historic Pools of Britain is indebted to Great Lengths’ co-author and Played in Britain series editor, Simon Inglis, for the vision, support and expertise that he has provided in its establishment. 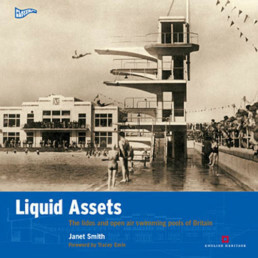 In addition to this, Simon has placed the detailed database produced by Ian Gordon and Jackie Spreckley for Great Lengths and Liquid Assets in the guardianship of Historic Pools of Britain. This invaluable resource – the Played in Britain Historic Pools Directory – provides the means for having an understanding of the state of historic pools across the country, and we are working now in partnership with Simon Inglis to update and maintain the Directory. Painting the picture of what we have lost, and what as a nation we must treasure, is one of the most important tasks of Historic Pools of Britain. The Played in Britain Historic Pools Directory will also be used for member information, stakeholder briefings and media updates.